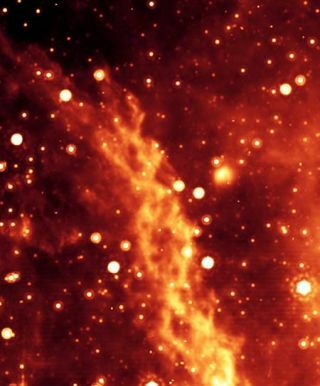 This is a color enhanced version of the infrared signal to make the Double Helix Nebula's features easier to see. The spots are mostly red giants and red supergiants. Many other stars are present, but are too dim to appear. "Nobody has ever seen anything like that before in the cosmic realm," said the study's lead author Mark Morris of UCLA. "Most nebulae are either spiral galaxies full of stars or formless amorphous conglomerations of dust and gas-space weather. What we see indicates a high degree of order." The DNA nebula is about 80 light-years long. It's about 300 light-years from the supermassive black hole at the center of the Milky Way. The nebula is nearly perpendicular to the black hole, moving out of the galaxy at a quick clip-about 620 miles per second (1,000 kilometers per second). Magnetic field lines at the galactic center are about 1,000 times stronger than on Earth. They run perpendicular to the black hole, but parallel through the nebula. Scientists think that twisting of these lines is what causes the double helix shape. While the black hole might be the first culprit to come to mind, it's more likely that the magnetic field lines are anchored to a giant gas disk that orbits the black hole several light-years away, researchers say. It's like having two strands of rope connected to a fixed point, Morris said. As you spin the strands, they braid around each other in a double helix fashion. In this case the gas and dust of the nebula makes up the strands. "It's as if there's a bar across the middle [of the black hole], or a dumbbell shape, where the strands are anchored, and as it spins around, it twists the strands together," Morris told SPACE.com. This process takes a long time, though, since the disk completes one orbit around the black hole roughly every 10,000 years. But that's an important number. "Once every 10,000 years is exactly what we need to explain the twisting of the magnetic field lines that we see in the double helix nebula," Morris said. The recipe for a DNA nebula is strict but simple. It requires a strong magnetic field, a rotating body, and a nebulous cloud of material positioned just right. Massive central black holes are the best sources for both the strong magnetic field and rotating body, and since most large galaxies have them, Morris expects DNA-like nebula may be common through out the universe. "I absolutely expect to see [this configuration] in gas-rich galaxies with all these elements in place," Morris said. However, these nebulas are tough to spot, and current technology limits scientists' observations to our galaxy.